In the late ninety seventies one of my favourite television shows was the US sitcom WKRP in Cincinnati. The character I remember most was Herbert Ruggles (Herb) Tarlek Jr., played by actor Frank Bonner. Herb was the epitome of bad salesmanship characterized by his boorish and tasteless approaches to clients. To complete his baboonish portrait, he wore loud plaid suits, with a belt that matched his white shoes. Herb was the man you would never knowingly join on an elevator to face the consequences of his talking your ear off with information that you would have trouble relating to. Fast forward to the second decade of the 21st century at a typical busy trade show when without warning you are approached by a modern day Herb who, while better dressed, still feels the need to overload you with information you care little about. You have just fallen victim to the greatest of exhibition sins – the poorly thought-out and executed pitch. If you are a fan of fairy tales then surely you will remember the story of “Goldilocks and the Three Bears,” written by British author Robert Southey. It’s the story a young girl named Goldilocks who finds herself in a bear’s home and searches for perfection as she works her way through porridge, chairs and beds before drifting off to sleep. Goldilocks teaches us that the perfect solution to things in life, like a product pitch, should not be too long, not too short, but just right. That’s the “Goldilocks Effect” that all front line staff who meets visitors at a booth should adhere to rigorously. A good presentation begins long before the exhibition. The features from the benefit. There is an old adage in sales that says, you don’t go shopping to purchase a 1/8th inch drill bit, what you really want is a 1/8th inch hole. What are you really selling? Make a list of all that your product (or service) provides. For example some of the features of an automobile might include, Exhaust Heat Recovery System, 2.4 Litre 4-Cylinder, DOHC, 16-Valve, Variable Valve Timing, Tier 2 Bin 3 Emission. Next ask yourself which items bring real value to your customer. You record your answers in a second column beside the feature. For example the Exhaust Heat Recovery System generates electric current from waste heat in your automobile to improve overall engine efficiency resulting with a great potential for fuel savings. What does your customer want? An Exhaust Recovery System or fuel savings? Identify your prospects and understand what issues are most important to them. Your customers are not one homogeneous group of people. Each has their own perspective, interests and level of knowledge, so a one-pitch-fits-all approach is clearly not going to work. If you haven’t already done the exercise then create a profile of your customer in as much detail as possible. Your profile goes beyond a simple description of demographics. Go a bit deeper into what motivates these people. If you are unsure, then perhaps it’s time to pause and conduct a bit of research. Get your front line people involved with this exercise and see if you can identify all the people they will come in contact with and identify their motivations. 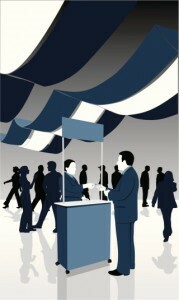 The next step is to compare your customer profile to the audited list of attendees provided by show management. What you will learn is that only a fraction of the potential attendees fit the profile. It also tells you that you may have many opportunities to meet people who can influence the final decision. These people may come from finance, administration, marketing, production, sales and so on. With this information in hand you can now refine your profiles to reflect all possible interactions at the show. Add this list to your list of features and benefits deciding on which benefits will be most applicable to each identified prospect. For example someone from finance may not be interested or not understand the nuances of your product’s performance capabilities but they will understand the impact of your product on the corporate bottom-line. Have you ever listened to a professional comedian tell a joke and thought it was the funniest thing you have ever heard? But when you try to tell the same joke to your colleagues, after the punch line they stare at you wondering what you thought was so amusing. The reason behind this is that we all have our own unique way of conveying information. Some phraseology works for some people and not for others. So the trick is to find ways of presenting information that fits your personality. You need to use words that you can say with enthusiasm, comfort and honesty. Fake it and you sound like the Monday morning comedian telling jokes that go flat. The way you find your voice is through practice. Rehearsal begins before you utter a word. Begin with the list of features and benefits that are most likely to appeal to your audience. Next decide how you will be presenting information. Think of the pitch in three parts: The opening, the body and the close. The body. Here is where the content of the presentation is customized. If you have done your work well, and asked the right questions you should have a good idea of your visitor’s specific interests. You now relate those interests back to the exercise you did before the show where you matched features and benefits to your various visitor profiles. Remember, you are most likely not going to make a sale now and the best you can realistically hope for is to leave this visitor with a positive feeling about you and your products and services so that when a follow-up contact is made there is a better than average chance the visitor will respond. The trick is to pick and choose those issues that will most likely impress your visitor. Making effective presentations does not come easily. It requires good planning and lots of training to ensure that the people working your booth maximize those precious few minutes they have with a visitor. So, just as Goldilocks proclaimed – not too much, not little, just the right amount will suffice. © 2012 by Barry Siskind. Barry Siskind is author of Powerful Exhibit marketing. He is also President of International Training and Management Company who offers a number of services to exhibitors including the creation and implementation of a mystery-shopping program. Contact Barry at barry@siskindtraining.com for more information.